My name is Jade Gartland and my Dog Lacey is a little character. She loves going on long walks with her mummy and chilling with her best friend Sooty (the cat), but her favourite things to do is cuddle up on the sofa with her mum or dad and sleep the day the away. I think she is the most cutest and lovable dog and hope that she wins the GSD of the month. What a gorgeous girl your Lacey is. Thanks so much for sharing all those wonderful pictures with us. We always love looking at them. It's so funny to see her lounging around on the couch. She seems absolutely at home there - and who could blame her? I'll bet you have a hard time finding room for yourself there don't you? Most people who aren't used to these big rascals can't believe just how low key they can be when they are used to being indoors. They like to sleep and rest around the home just like we do. I don't allow my big fella to get on the furniture but he does have several beds around the house and many cushy cushins to lay on and he loves to nap a good bit of the day. If they are raised indoors they get into a routine just like us humans. 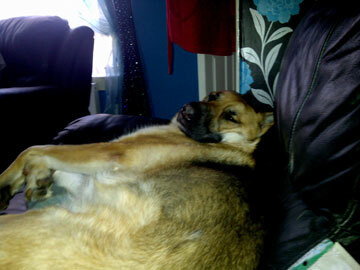 And it seems Lacey has claimed the sofa as hers. :~) I wish you much luck with Lacy. 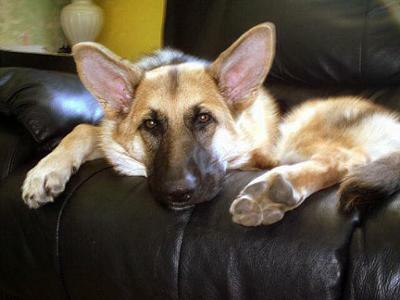 She's a fine example of what great companions German Shepherds can be in the right home and with the right owners. Thank you, Jade, for sharing your story, & beautiful photos of Lacey.. I hope you, & Lacey, will have a happy, life together. She is a precious GSD! Lacy has such a Pretty face, just precious. 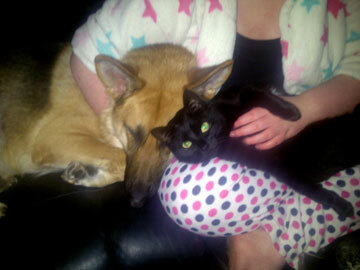 She so calm even with the kitty. 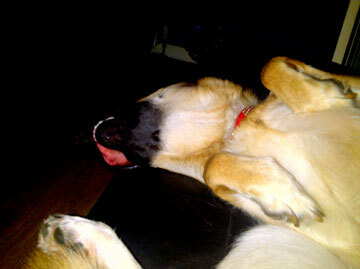 She is cute but I think I have the cutest Shepherd too,Mia she is 2, we are all proud shepherds' parents. We have so much joy, she is "something else". I hope Lacey wins the photo contest she is adorable! I'm sure there is a dull moment at your house. She's your protector - that's what Shepherds do - Protect it's in their blood. Take care of your Precious Lacey and she will always be by your side and Protect you.